I took this photo in the late afternoon. 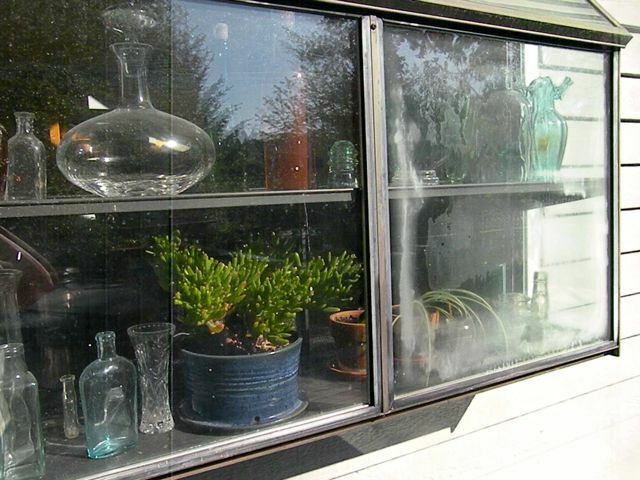 I wanted to capture the mostly glass objects in the kitchen window from the outside. It was kind of a joke. We were kidding around about how valuable they were, which they are not. And we were saying that we should have a photo for insurance purposes, and in case the Met wanted to buy the collection. So I took a photo, several actually. This one really struck me because of the reflection in the glass of the sky and the trees behind where I was standing. That was not what I was seeing at all. I just focused on the objects, and look what else I else got. It reminded me how much we all mirror each other whether we know it or not. We know each other by knowing ourselves, and vice versa. “Just like me” as my friend Anita Bondi is so fond of saying. When I took the photo, I only saw what was inside the kitchen window. The mirror reflection showed how much more there was to see. Just like life. Just like me. interesting “commercial” at the end of the blog post honey…what is that about? love the idea in the post and yes, the mirror is always there for us….ahhhh….